Vinification & Aging: The grape stalks were removed before pressing and the pressed grapes were transferred to stainless steel containers at the temperature of 36 °F. Then, the fermentation reaches 5.5 alcoholic degrees. In order to achieve the fullness of color and aroma, the bottles remain for a month in a temperature controlled room prior to release. 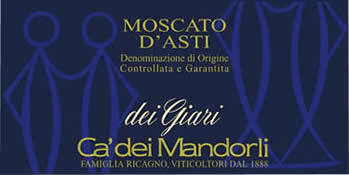 Description: Rich and intense bouquet with fresh notes of mint, sage and honey. Balanced and sparkling.